Oscars 2016 – Which publisher wins the Oscar for the highest visibility in the Google News Boxes? Leonardo DiCaprio has been nominated five times for an Oscar so far – this year, for his sixth nomination, it worked. He received the Academy Award in the category “Best Actor” for his role in “The Revenant”. Beforehand, there were a lot of speculations about Leonardo DiCaprio making it this time. 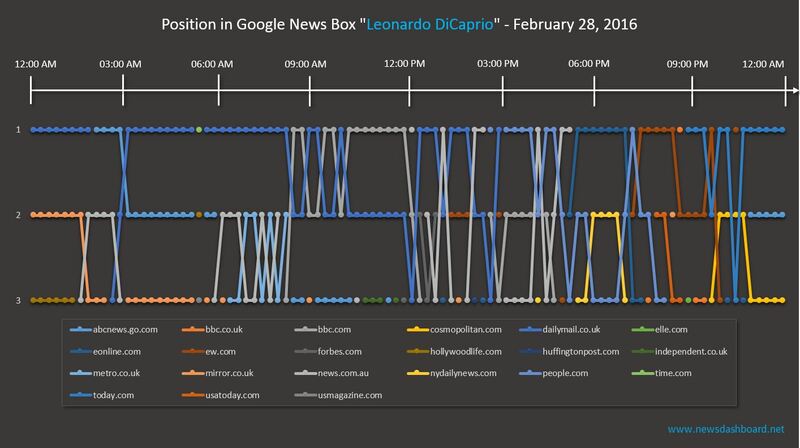 We analysed, which news publisher was able to benefit most from Leonardo DiCaprio winning the Oscar, due to high visibility in the Google News Boxes. Surprisingly, not an American, but a British news publisher is leading the top 5. Dailymail.co.uk made it to the first place with a visibility of 10 percent, followed by usmagazine.com with 9.38 percent. Another British news player is holding the third place: telegraph.co.uk with 8.19 percent. American news players were thus not able to prevail in the News Boxes for Leonardo DiCaprio like the British. This is surprising, since the Oscars are Hollywood’s flagship, and DiCaprio is American. However, there are differences between the single keywords. Therefore we looked more detailed at two keywords. The two following charts show the course of the day of the Google News Box on 28 February 2016. They show, which news players were at the 1st, 2nd and 3rd place at certain times of that day. On the top of the chart is the crawl date, underneath there are the single positions in the News Box and the respective news publishers that were able to win the Google News ranking. The upper chart shows that between Midnight and 2pm, English news players dominate the News Box for the keyword “Leonardo DiCaprio”. On the 1st place in the News Box, there are mostly dailymail.co.uk and bbc.com during that time. The 2nd and 3rd place are held – amongst others – by mirror.co.uk and metro.co.uk. The only American news publishers, who made it into the News Box between Midnight and 2 p.m. occasionally, are hollywoodlife.com and usmagazine.com. During the afternoon until night, things change a bit: there is higher fluctuation on the highly coveted places in the Google News Box. People.com, eonline.com, ew.com and today.com take turns on the first place until late at night. There are also almost only American news players on places 2 and 3, like nydailynews.com, abcnews.go.com or usatoday.com. During the Academy Award ceremony, American news publishers dominated the News Box, while mainly English news players were represented in the News Box beforehand. 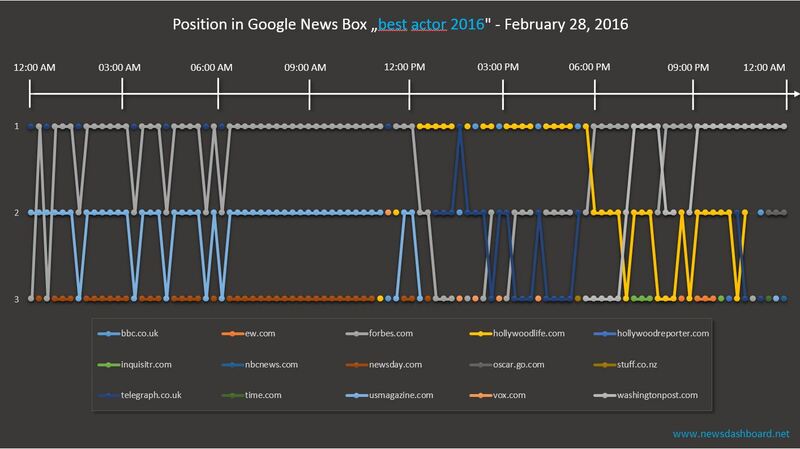 Things look different for the second keyword “best actor 2016”: Almost only American news players are constantly present in the Google News Box of 28 February 2016. There is also less fluctuation than for the keyword “Leonardo DiCaprio”, which we have just looked at. Forbes.com, washingtonpost.com and hollywoodlife.com rank on first position in Google News Boxes longest. It was not only Leonard DiCaprio, who won an Oscar. Many other actors, directors, movies, technicians, sound recordists and cameramen were nominated, and some of them were able to take an Oscar home with them. Our set of keywords, for which the News Dashboard crawled the Google News Boxes’ data, was accordingly big. It contained among others the names of all nominated actors (main and secondary character), the names of the nominated movies, and more general keywords around the Oscar (e.g. “Oscars 2016”, “Oscar Nominees 2016), Oscar best short film”, etc.). All in all, we considered 98 keywords around the Oscar. 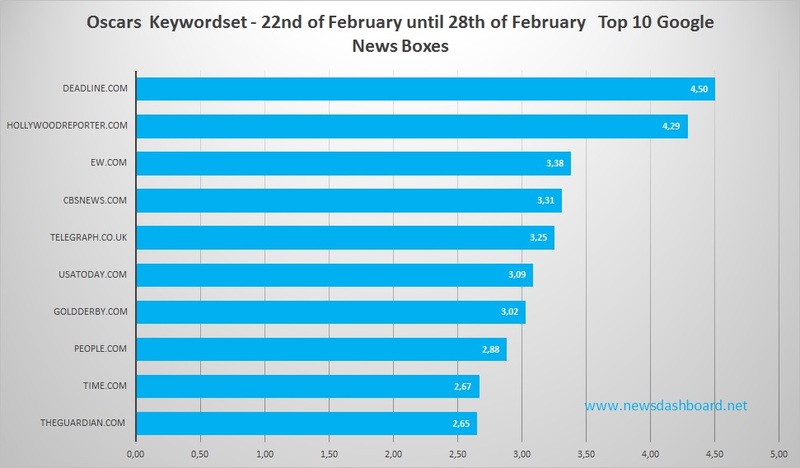 We would now like to announce the winner of the overall set of keywords: This means that we analyse, which news player was able to win the Google News ranking most. On the day of the ceremony, i.e. 28 February 2016, two British news players were able to dominate the top 5. On the 1st place, with a visibility of 8.54 percent, is telegraph.co.uk, which were already present in the top 5 for the Leonardo DiCaprio set of keywords. The second British news player is dailymail.co.uk, and they are on place 5 with 4.07 percent. 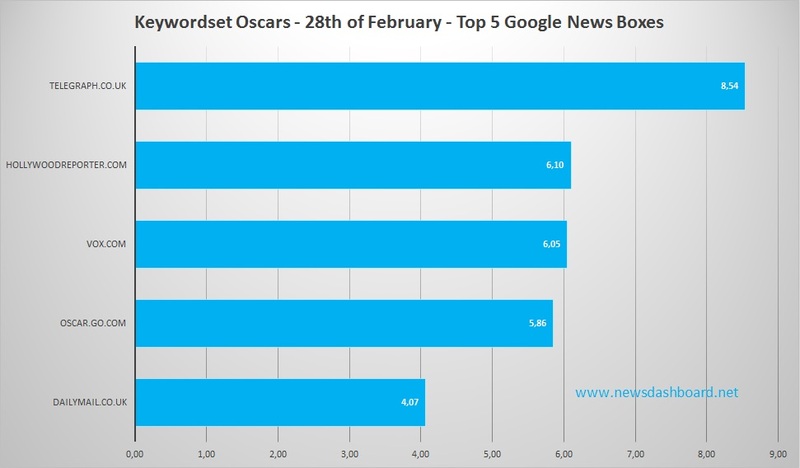 Surprisingly, two British news players are in the top 5 concerning the visibility in the Google News Boxes for the full set of Oscar keywords again. Places 2 to 4 are relatively close together and dominated by American news players. Hollywoodreporter.com has a visibility of 6.10 percent in the Google News Boxes for the overall set of keywords; vox.com reaches 6.05 percent, and oscar.go.com 5.86 percent. 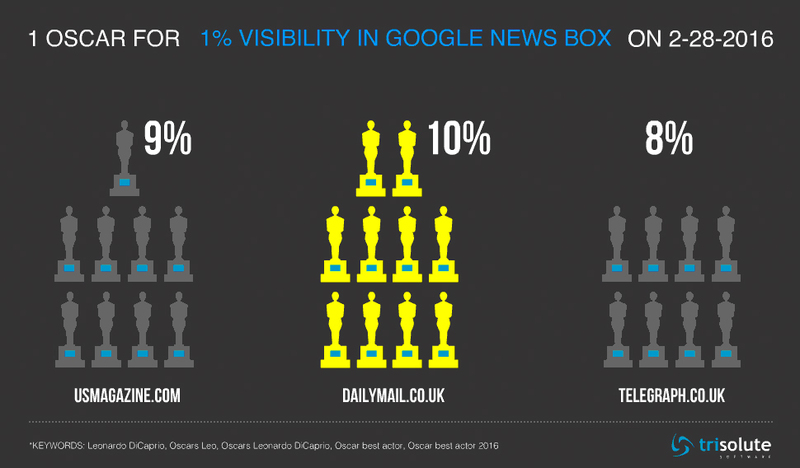 When we look at the preliminary reporting for the Oscars over a longer time span, hierarchies concerning the Google News visibility in the News Boxes change. The following chart shows an overview of the top 10 news players, which ranked most for the Oscar set of keywords of 98 words and combinations of words between 22nd and 28th February. No news player specifically dominates here: the percentages of the top 10 news players range between 2.65 and 4.5 percent and are thus not far apart. Deadline.com was able to hold steady at the top. Hollywoodreporter.com follows on the 2nd place. Since deadline.com was not in the top 5 on the day of the Oscars, this news player was mainly represented in the News Boxes during the days before the ceremony. Hollywoodreport.com also went strong on 28 February (see keyword set Oscars – 28th of February – top 5 Google News Box). Places 3 and 4 are covered by ew.com (3.38 percent) and cbsnews.com (3.31 percent). Then follows the British site telegraph.co.uk. Other news placers in the top 10 are usatoday.com, goldderby.com, people.com, time.com, and theguardian.com.